For the past couple of weeks, I have been working on a VR version of one of my favorite puzzle games, the Nonogram, also known as Picross or Griddlers. These are puzzles where you must figure out which cells in a grid are colored in by using column and row counts. I thought this would be perfect for a nice, relaxing VR game. I call it Lava Flow. 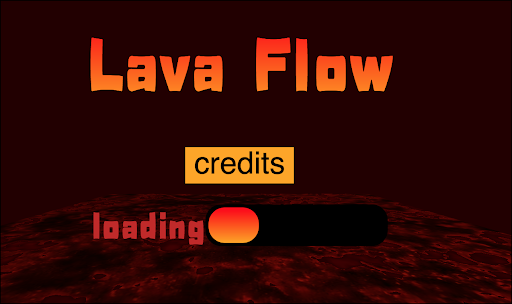 Since Lava Flow is meant to be a casual game, I want it to load quickly. My goal is for the whole game to be as small as possible and load under 10 seconds on a 3G connection. I also wanted it to run at a consistent 60 frames per second (fps) or better. 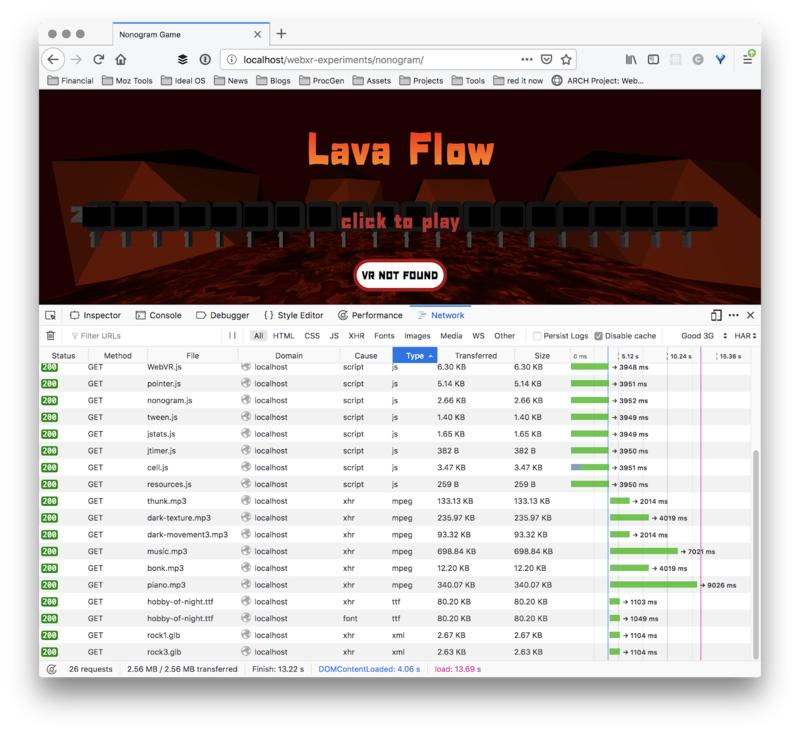 Consistent frame rate is the most important consideration when developing WebVR applications. Before I can improve the performance or size, I need to know where I’m starting. The best way to see how big my application really is is to use the Network tab of the Firefox Developer tools. Here’s how to use it. Open the Network tab of Firefox developer tools. Click disable cache, then reload the page. At the bottom of the page, I can see the total page size. When I started this project it was at 1.8MB. My application uses three.js, the popular open source 3D library. Not surprisingly, the biggest thing is three.js itself. I’m not using the minified version, so it’s over 1MB! By loading three.min.js instead, the size is now 536KB vs 1110KB. Less than half the size. 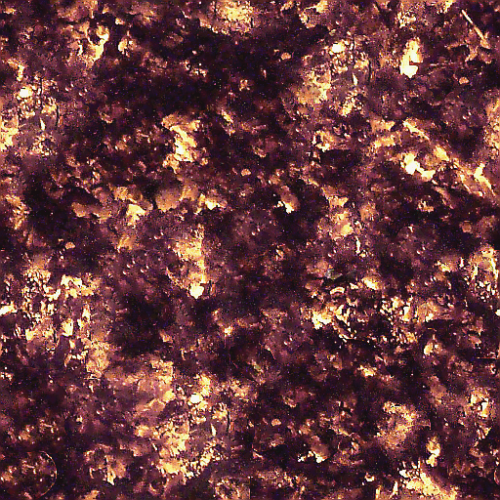 The next biggest resources are the two lava textures. They are PNGs and collectively add up to 561KB. I re-compressed the two lava textures as JPEGs with medium quality. Also, since the bump map image doesn’t need to be as high resolution as the color texture, I resized it from 512×512 to 128×128. That dropped the sizes from 234KB to 143KB and 339KB to 13KB. Visually there isn’t much difference, but the page is now down to 920KB. I don’t really want to wait for the background music to load, however it would be nice to have the sound effects preloaded. Plus audio elements don’t have the control I need for sound effects, nor are they 3D-capable. 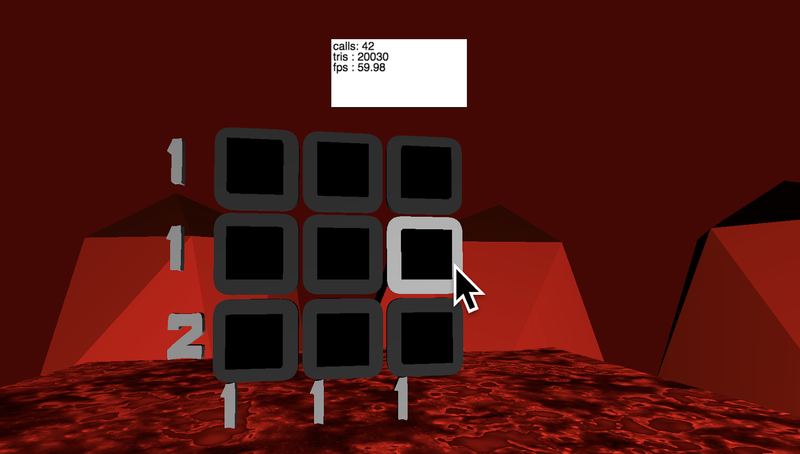 So I moved those to be loaded as Audio objects with the AudioLoader within three.js. Now they are fully loaded on app start and are accounted for in the download time. With all of the audio (except the background theme), everything is 2.03 MB. Getting better. There is a weird glitch where the whole scene pauses when rebuilding the game board. I need to figure out what’s going on there. To help debug the problems, I need to see the frames per second inside of VR Immersive mode. The standard stats.js module that most three.js apps use actually works by overlaying a DOM element on top of the WebGL canvas. That’s fine most of the time but won’t work when we are in immersive mode. To address this, I created a little class called JStats which draws stats to a small square anchored to the top of the VR view. This way you can see it all the time inside of immersive mode, no matter what direction you are looking. I also created a simple timer class to let me measure how long a particular function takes to run. After a little testing, I confirmed that anywhere from 250 to 450 msec is required to run the setupGame function that happens every time the player gets to a new level. I dug into the code and found two things. First, each cell is using its own copy of the rounded rectangle geometry and material. Since this is the same for every cell, I can just create it once and reuse it for each cell. The other thing I discovered is that I’m creating the text overlays every time the level changes. This isn’t necessary. We only need one copy of each text object. They can be reused between levels. By moving this to a separate setupText function, I saved several hundred milliseconds. It turns out triangulating text is very expensive. Now the average board setup is about 100 msec, which shouldn’t be noticeable, even on a mobile headset. As a final test I used the network monitor to throttle the network down to 3G speeds, with the cache disabled. My goal is for the screen to first be painted within 1 second and the game ready to play within 10 seconds. The network screen says it takes 12.36 seconds. Almost there! As I worked on the game, I realized a few things were missing. There should be a progress bar to indicate that the game is loading. 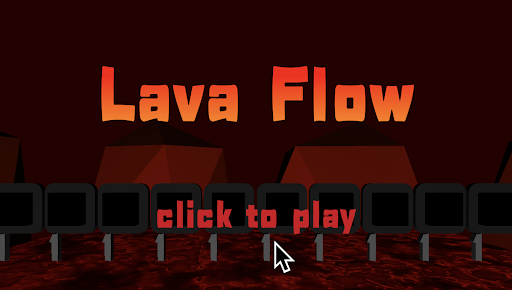 The tiles need sound effects when entering and exiting the mouse/pointer. There should be music each time you complete a level. The splash screen needs a cool font. Then update it whenever the loading manager tells me something is loaded. Next up is music and effects. Adding the extra music is another 133KB + 340KB, which bloats the app up nearly another half a megabyte. Uh oh. I can get a little bit of that back with fonts. Currently I’m using one of the standard three.js fonts which are in JSON format. This is not a terribly efficient format. Files can be anywhere from 100KB to 600KB depending on the font. It turns out three.js can now load TrueType fonts directly without first converting to JSON format. The font I picked was called Hobby of Night by deFharo, and it’s only 80KB. However, to load TTF file requires TTFLoader.js (4KB) and opentype.min.js which is 124KB. So I’m still loading more than before, but at least opentype.min.js will be amortized across all of the fonts. It doesn’t help today since I’m only using one font, but it will help in the future. So that’s another 100KB or so I’m using up. The lesson I’ve learned today is that optimization is always two steps forward and one step back. I have to investigate everything and spend the time polishing both the game and loading experience. The game is currently about 2.5MB. Using the Good 3G setting, it takes 13.22 seconds to load. When I added the new sound effects, I thought of something. All of them are coming from FreeSound.org which generally provides them in WAV format. I have used iTunes to convert them to MP3s, but iTunes may not use the most optimized format. Looking at one of the files I discovered it was encoded at 192KBps, the default for iTunes. Using a command line tool, I bet I could compress them further. It went from 348KB to 185KB. That’s a 163KB savings! In total the sounds went from 10MB to 4.7MB, greatly reducing the size of my app. The total download size to start the game without the background music is now 2.01MB. I loaded the game to my web server here and tested it on my VR headsets to make sure everything still works. Then I tried loading the public version in Firefox again with the network tab open. I noticed something weird. The total download size is smaller! In the status bar it says: 2.01 MB/1.44 MB transferred. On my local web server where I do development, it says: 2.01 MB/2.01 MB transferred. That’s a huge difference. What accounts for this? I normally do all of my development on the local web server and only use the public one when the project is ready. This is a lesson to look at everything and always measure. These are the lessons I learned while tuning my application. Making the first version of a game is easy. Getting it ready for release is hard. It’s a long slog, but the end results are so worth it. The difference between a prototype and a game is sweating the little details. I hope these tips help you make your own great WebVR experiences. Rather than using MP3, why didn’t you use Opus codec for compressing your audio into smaller sized files? That’s a good point. I’ll try that next time. That’s great to here. Let me know when you have something I can test out. I’m happy to review and critique. The title is misleading/click-baity. It should say “Reducing loading time of a Three.js game”. Performance makes you think about increasing the framerate and doing update loop/rendering loop optimizations. Plus, I didn’t see any VR related performance tweaks. For loading the audio, you can combine sound effects into an audio spritesheet, the music could be streamed. All the tweaks mentioned are just general tips to “how to reduce site loading time”, which already has thousands of search results. Some if it is about loading time, that’s true. But I also covered changing the init code to not do extra work with font loading, switching to truetype, testing FPS within VR (which you couldn’t really do before), and how to handle progress bars from within ThreeJS. What would you like me to cover for next time?